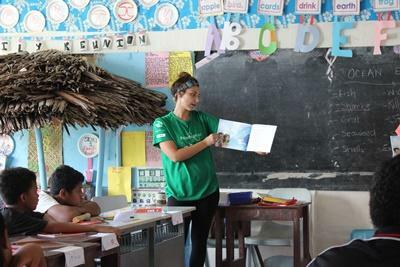 Volunteering on a Care project in Samoa is a great way to get involved with the local community of this proud and welcoming island nation. Care volunteers can join us during a gap year, summer placement or career break. Volunteers working at the kindergartens provide local staff with a helping hand, looking after and caring for the children. It is also the perfect opportunity to put any skills and interests you have to use, whether it is arts and crafts, or teaching games and songs to the children - your suggestions will always be well received. By showing initiative and enthusiasm the options available are endless. 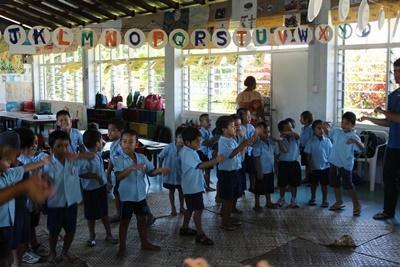 In addition to working in kindergartens and with children who have special needs, we also work with Samoa Victim Support Group who provide much needed shelter and support to victims of domestic and sexual abuse. People who attend the three centres often have nowhere else to go so they appreciate all the assistance they can get, whether it be spending time with the young mothers and helping to look after their babies, providing guidance on health and hygiene, running classes for the children who are not attending school or just being a general helping hand around the centre. Once a week, Projects Abroad runs an activity programme for children who are forced to sell on the streets. They are aged between 7 and 17 years and they have lived tough lives. They are out selling until very late at night due to the pressure of making the money to take home to their family. The children meet at the office once a week and the volunteers help them with homework, teach them songs and play games. The purpose of the weekly programme is to offer them a space where they can have fun and be children who laugh and enjoy life. We aim to help them understand the importance of going to school, and to equip them with the skills to help get them off the streets in the future. Volunteers normally live with a host family within a short bus ride from their project. You can join the Care project in Samoa for one, two or three weeks if you don't have time to join us for four weeks or more. This project has been selected by our local colleagues as being suitable for short term volunteering for both the host community and the volunteer Although you will gain a valuable cultural insight and work within the local community please be aware that you may not be able to make the same impact as someone volunteering for a longer period.